UGL Drylok Extreme, Koster NB1 Grey, Xypex Concentrate: Do these interior waterproofing systems really work? If you can make complete sense of this diagram, please let me know. 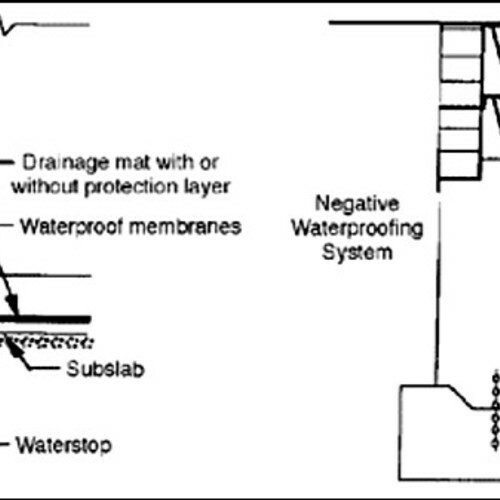 The diagram illustrates the U.S. Army Corps of Engineers' CRD-C48-92 negative side waterproofing test. Back in May 2017 I wrote a blog about negative side waterproofing (NSW). But I was still feeling troubled. 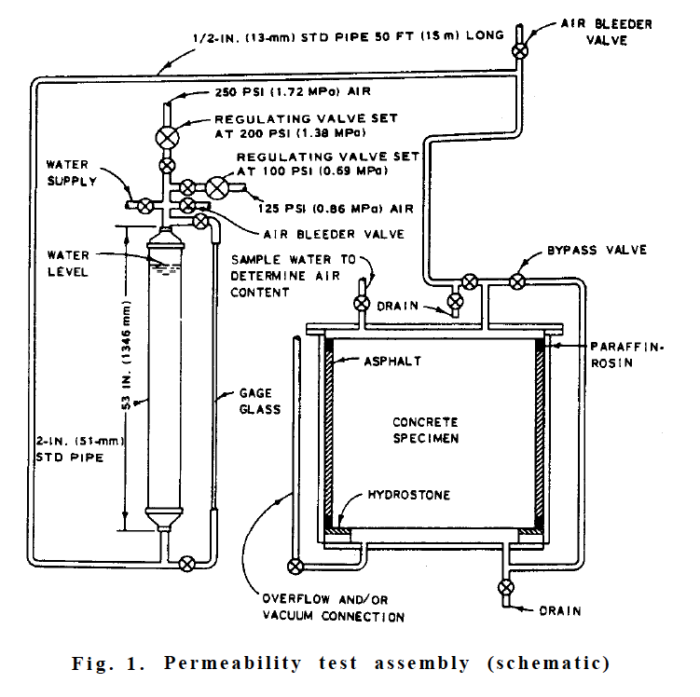 The standardized test for NSW from the U.S. Army Corps of Engineers (“Standard Test Method for Water Permeability of Concrete”) is frankly really complicated; the schematic seems impossible to decipher (see the Image #1 at the right). Instead of using this test, could we do a real-world, Wingnut-style test for negative-side waterproofing? I started by turning things inside out: I built hollow columns of masonry materials, waterproofing the outside and filling the hollow centers with water. Building brick hollow columns seemed too hard to start with, as did building forms for making my own hollow concrete columns. (I tried to find 12-inch diameter concrete pipe, but could not find any in my neck of the woods.) But for about $50, I bought enough mortar, 8″ by 8″ corner block, and patio pavers to build 4 three-course CMU columns (see Images #2 and #3, below). I would like to thank technical folks like Roman Mahles at Koster USA and Les Faure at Xypex for their help on developing my Wingnut test. While I am in no way suggesting that they “blessed” or take responsibility for my testing, they did review my approach as a decent proxy for real-world performance. 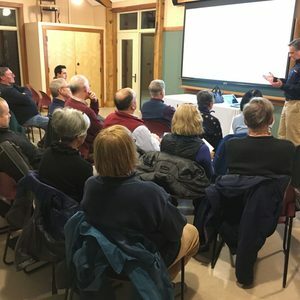 And both Koster USA and Xypex provided free waterproofing materials for my basement testing as well as the testing subsequently conducted during an educational session () at the this past February. As a baseline, I filled my “control” concrete masonry unit (CMU) column with water. (See the video below.) No big surprise here: this column leaked like a sieve. The uncoated CMU column is filled with water. I then carefully followed the installation instructions for my three waterproofing treatments: , , and . After testing each of these coating treatments, I tested the manufacturer’s “active leak” patch product by drilling 5/8-inch holes at the bottom of each water-filled column. is guaranteed to work for up to 15 feet of head or water pressure and for up to 15 years. It is not a crystalline system — it’s more paint-like — although the manufacturer states that it does penetrate the concrete. A double-coating of UGL Drylok Extreme that still weeps water. Initial UGL DryLok Fast Plug active water leak test. After getting the Fast Plug to hold, water was still leaking. When I described my CMU column test to Xypex, they immediately balked, saying that CMU blocks differ too much in composition to reliably water seal; there is not enough available calcium hydroxide — Ca(OH)2 — in the CMUs for the crystals to grow into the block. Their technical staff eventually agreed that the solution was to allow more time for the crystals to penetrate, and to delay the water test for two weeks. Two weeks later, I still had very slow seepage down near the bottom of the Xypex CMU column (see Images #6 and #7, below). Xypex stated there just must not be enough available Ca(OH)2. They advised me to wet the block with a spray bottle and rub in Xypex Patch-n-Plug. That did the trick: no more leaks anywhere. Xypex Patch-n-Plug stops the active water leak. The Xpex Concentrate coating plus a skim rub coat of Patch-n-Plug had good results: the whole column is dry on the exterior. Apply their primer, Polysill TG 500, to the CMU block prior to apply their waterproofing NB1 Grey. When I did all this, I was still getting just a bit of seepage at certain spots down low on the Koster CMU column. 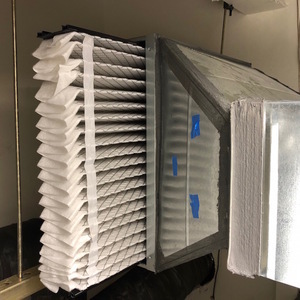 Koster staff assured me that it just takes longer for sufficient crystal growth in CMU block, so I should wait two weeks and then test again. That did the trick; after two weeks I had no water leaking anywhere on the Koster column (see Images #8 and #9, below). When I drilled a hole and conducted the active leak test for the Koster CMU column, applying the KD2 Blitz Powder, the results were very similar to the Xypex test: the plug held and there were no water leaks anywhere. (See the video below). Koster KD2 Blitz Powders stops the active water leak. In the chart below, I got the UGL Hydro-Lok costs right off of the Internet (Home Depot prices). 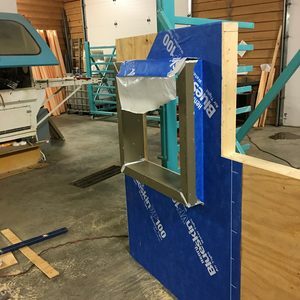 The Koster USA and Xypex prices were provided by the manufacturers since their materials are exclusively retailed through qualifying distributors of concrete materials and accessories. The two crystalline waterproofing systems (Xypex Concentrate and Koster NB1 Grey) worked with the 2+ feet of head used for this experiment. The one non-crystalline coating (UGL Drylok Extreme) that I tested did not provide a waterproof system at 2+ feet of head. 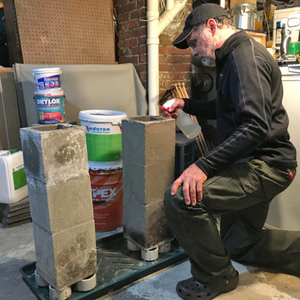 While we might think of brick or block or poured concrete as being just different foundation materials, there are big differences in how waterproofing systems will work with each material, due to differences in the composition, the chemistry, and the variability of these materials. Crystalline NSW systems may take time to reach their full waterproofing capability, especially with CMU foundation walls. Coating the walls with any waterproofing material must be meticulously done; even the tiniest of voids or incomplete coverage provides a path for water. Penetration of the crystalline systems requires “available” or “free” water. With the Xypex system, instructions state that application should be to a “saturated surface dry” substrate. 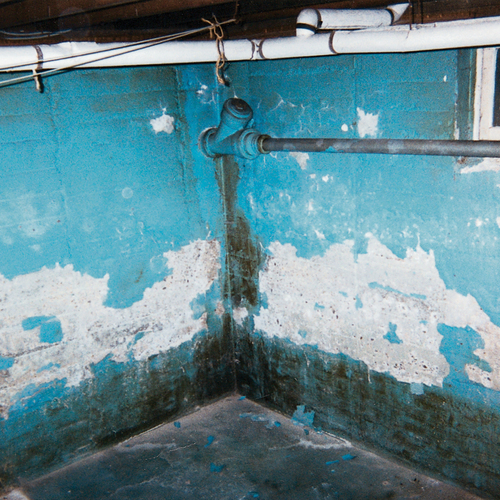 This experiment does not change the fact that if cracks in negative side waterproofing develop over time, the waterproofing system may fail. Each of the “fast patch” hydraulic cement materials I tested successfully closed off an active (water flowing) leak. 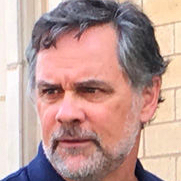 In addition to acting as GBA’s technical director, Peter Yost is the Vice President for Technical Services at in Brattleboro, Vermont. 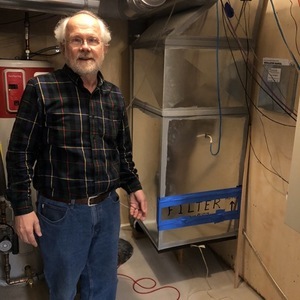 He has been building, researching, teaching, writing, and consulting on high-performance homes for more than twenty years. An experienced trainer and consultant, he’s been recognized as NAHB Educator of the Year. 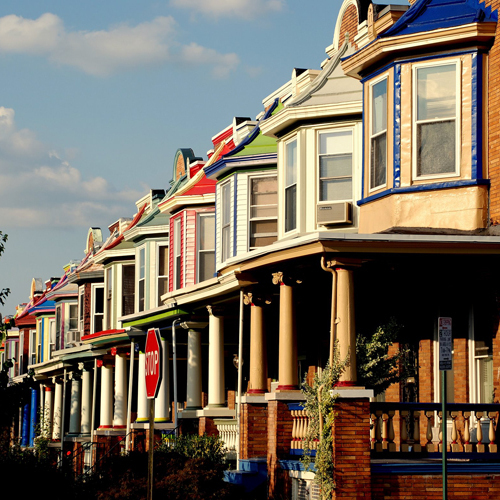 Do you have a building science puzzle? . You can also to get a free report on insulation, as well as regular posts from Peter. Very timely for my own basement. We are up the hill from you and still have 30" of snow on the ground which will soon seek to enter my basement. Where did you get the Xypex from locally? you can send me an email. Nice work in reducing the 15-value test setup to a zero-valve test setup. I also appreciate the description of the interaction with the manufacturers--not only does that provide honesty in reporting but it also demonstrates that the manufacturers know what they are talking about. do you have any experience with a product called Ghost Shield Lithi-Tek 9500? it's a concrete sealing product.